Unschooling Homeschool - Is it Right for You? Whether you agree with an unschooling homeschool model or not, it is a method of homeschooling that many families use. It's interesting to look at the way that this word has come into existence and how the meaning of it has changed over the years. John Holt is the main reason for the positive references to this word. Here is an article about it and my comments at the end. On the surface, it would seem that unschooling homeschooling is a contradiction in terms. However, when we consider the genesis of these terms and their present usage, it becomes clear that they are closer to being relatives than neighbors or enemies. The etiology of these concepts are quite interesting. Like all words, it is hard to pinpoint the exact moment that a word came into existence. Oftentimes, the person who popularized a word got the same from someone else who may have overheard the expression in a conversation to which she was not privy and thus the word took on a meaning other than the one intended when first it was used. According to Billy Greer in an article aptly entitled, "Unschooling Or Homeschooling," the term first appeared in an article by one John Holt in 1977 when he used the term to refer to those who took their children out of public schools and taught them at home. Homeschooling did not appear as the term for this phenomena until around 1980. However, prior to this usage, the word unschooled meant someone who had either dropped out of school or who had never attended school and as such it was a word of derision. Holt, however, used the word to mean that one had withdrawn from the rigors and formalities of public school, which he considered not a very good education at all, and one was attempting to reclaim the historical nature of education as being received at home under the supervision of a private tutor. But after homeschooling came into vogue to describe the process of teaching one's child at home, the meaning of unschooling changed to refer to a reaction to homeschooling! That is, one who chose to forgo the formal, and what many considered uncreative rigors of home school curriculum, was said to be unschooling. Today, the term means a sort of natural approach to learning which does not have a formal curriculum track but which allows the student to set her or his own path of learning. One of the more popular curriculum to develop in response to this trend is what is called unit studies. More about this innovative approach to learning can be had by clicking on the link below. My comments: I had never thought about the evolution of this word before, but it makes sense when we think back to what the word "unschooled" meant and how people related that to unschooling. It's true that it is now seen as just a natural method of homeschooling. I don't know if all unschoolers use unit studies for their main source of curriculum or not, but they certainly work in a more relaxed setting. I think we become an unschooling homeschool in the summer because we allow natural learning to take place when we are gardening, swimming, working around the house or site seeing. I don't know if I could ever take on a total unschool method of homeschooling in our home, but I do respect those that can make it work. 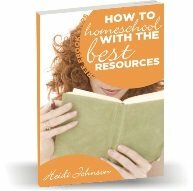 If you become part of a homeschool support group, homeschool co-op, or even an email group, you could share ideas of what has worked and what has not worked for you in implementing this method of homeschooling.